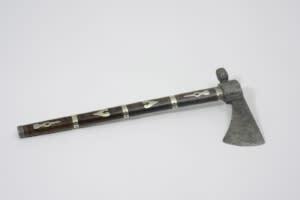 Albany, N.Y. – The New York State Museum has announced that an 18th-century Native American tomahawk gifted to Cornplanter, the respected Seneca leader, by President George Washington in 1792 has been returned to the Museum’s collections and will go on exhibit in the State Museum’s main lobby July 17 through December 30. The State Museum is a program of the New York State Education Department’s Office of Cultural Education. Located at 222 Madison Avenue in Albany, the Museum is open Tuesday through Sunday from 9:30 a.m. to 5:00 p.m. It is closed on the Fourth of July, Thanksgiving, Christmas, and New Year&apos;s Day. Admission is free. Further information about programs and events can be obtained by calling (518) 474-5877 or visiting the Museum website at www.nysm.nysed.gov.